The ATP or Adaptive Training Pistol is the one of the most awaited pistols to ever be released from KWA. The ATP features an extremely high quality metal slide and polymer lower receiver just like some of the most popular real steel pistols on the market. The slide features both forward and rear cocking serrations, making the ATP extremely easy to manipulate. Subdued KWA trade marks are featured on both sides of the slide to give it a more streamline look. 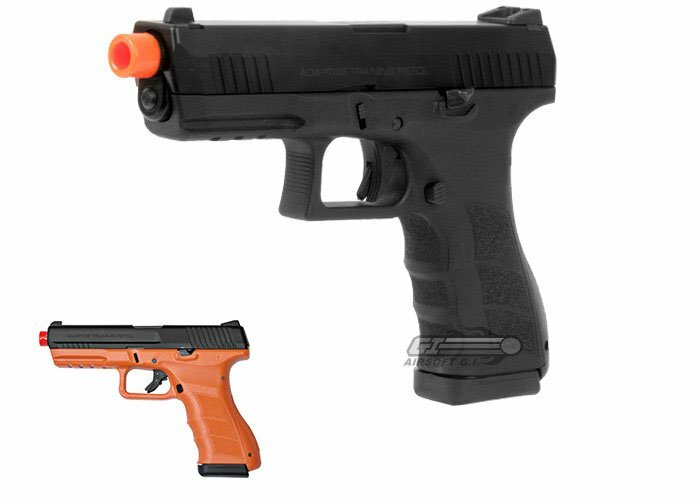 The lower receiver of the ATP sports many of the most popular features that are seen on some of the most popular modern pistols such as a picatinny rail and trigger safety. The aforementioned rail is located under the front of the gun and gives the user the ability to mount a tactical flashlight or laser for low light conditions. The magazine and slide catch are both placed strategically so that the user can easily manipulate them without moving the hand. 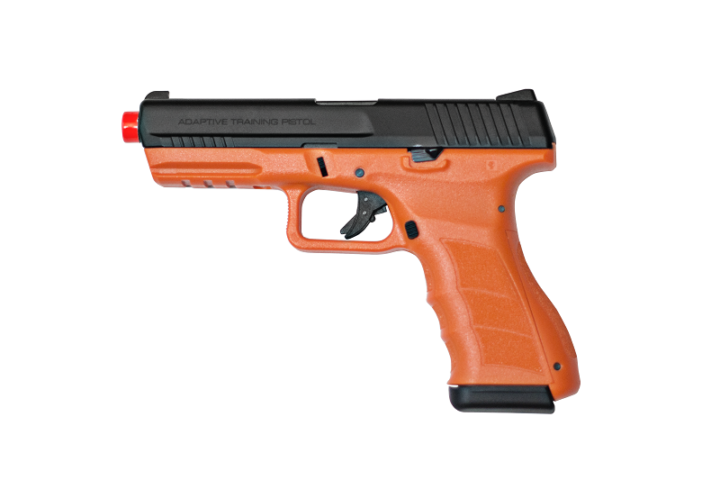 To maximize user comfort and to help the user maintain a firm grip on the gun at all time, the grip of the gun is made to contour to the users hand and features a rough texture to provide slip protection. An adjustable back-strap is also featured on the lower receiver of the ATP, allowing the user to either choose the swelled back-strap for a larger grip or the slim line for a more 1911 style feel. The KWA ATP is powered by KWA's new and extremely impressive NS2 system. The NS2 system gives the ATP an extremely crisp and strong kick with each and every shot. The ATP also is very gas efficient due to the NS2 system and can easily clear a entire magazine with very little cool down. The KWA ATP is a true show stopper and is definitely a huge contender in the GBB market. This is the newest version of the ATP with the subdued slide design, trigger safety, and included pistol grip back strap. This gun is great for anybody looking for a reliable sidearm, I've owned it since it's release and have never had a problem with it as of yet. The NS2 system is very efficient and you can easily shoot 2 mags on one gas fill. With the option of a 50 round party mag you can't go wrong. Never experienced a problem with this gun. When I first bought the ATP, I went to some reviews on YouTube to see how people liked it. After, I opened the gun up and it revealed how dry the gun actually was. Right when you get the gun, use the lube they give you. ( if you don't know how to use it, go on YouTube and use a tutorial) I am fairly pleased with this guns performance and has efficiency. 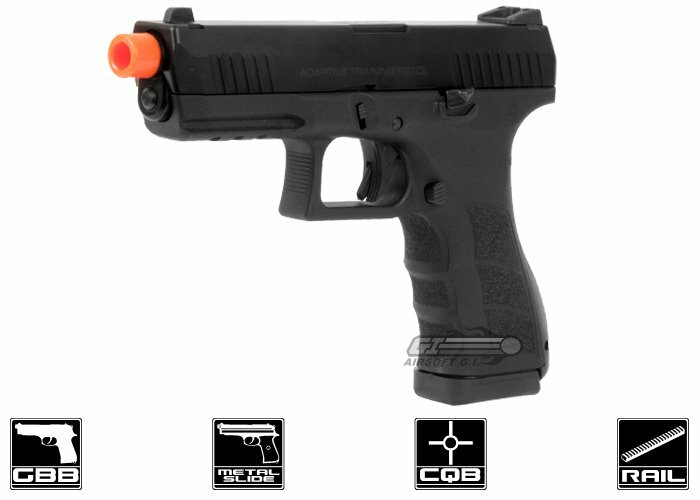 KWA has yet brought us another great gun for the Airsoft community. - you can buy an extended magazine for it! It's a great gun overall! What are you doing if you don't have it? - no other cons, great gun! An incredibly well designed and mostly reliable pistol. I've had mine for a while now and the accuracy and gas consumption are pretty damn good. The FPS is great at 350 with .2s and about 330 with .25s. Hopup is adjustable and it comes with a tool. Only issues I've had with it are as follows: when I first got mine, the trigger spring had come loose and needed to be fixed, and the mags are really expensive (I still only have one). Overall, an excellent "G-word" simulation and a good GBB pistol all around!